What is the online assessment? The Online Assessment is a self-measurement tool called the Susgauge. The Susgauge provides you with a simple overview of your current social, environmental and economic performance in nine areas of sustainability and enables improvement and achievement to be clearly demonstrated. 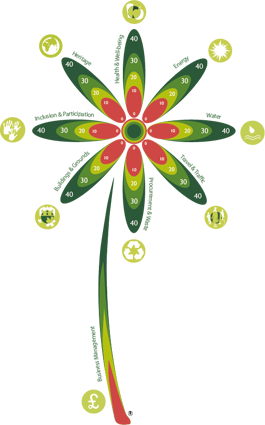 The Susgauge is represented by the diagram of the Susgauge flower, with the nine areas measured – the Susgauge ‘petals’ and the stem. The subject areas making up the Susgauge are considered good practice for schools, businesses and communities to constantly review and improve upon. You may need more than one person to answer all the questions, answers can be stored and completed when you have the information. Include as many people as possible, in the assessment. You might want to have different people completing each section with one person who checks that everything is completed. If you need more information to answer the questions you can move to the seed pack for that particular subject where you will find some explanations of what you need to be doing to score well. Without registering you can take a quick and easy overview assessment to see how sustainable your school is.